Your baby's first Christmas is a special time. Celebrate this event and remember it forever with a personalized baby's first Christmas stocking. The most difficult decision isn't whether or not to get your baby's first Christmas stocking, but how to decide from among our varied selection. We have personalized baby Christmas stockings that can include images such as a musical ornament, a baby rattle, even animals such as penguins and polar bears. 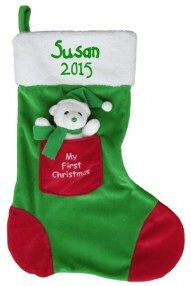 Personalize your baby's first Christmas stocking with their name and the year. Make this this holiday first a cherished memory you will never forget with your little one. A first Christmas will always be a wonderful memory for you and your baby. 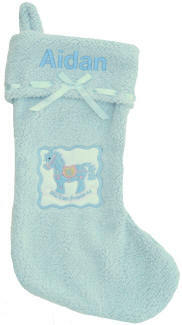 This Christmas stocking will be a fun addition to your mantel and a keepsake of their first Christmas. Personalize with a name, first Christmas, and year if desired. Polar bear toy hangs from the cuff. 16 in. Cute musical penguin ornament is attached to this baby's first Christmas stocking. 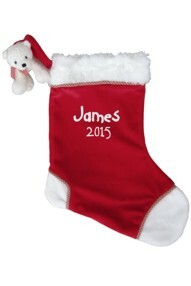 This red and white stocking can be personalized with baby's name, First Christmas, and the year if desired. 16 in. A wonderful keepsake of baby's first Christmas. Baby's first Christmas will be the main event this year. Hang this first Christmas stocking from your mantel, personalized for a wonderful first Christmas keepsake. Bear rattle included in the pocket. 16 in. Cute and cuddly, this fleece first Christmas stocking personalized with his name embroidered on the cuff will be a wonderful first Christmas keepsake. 19 in. 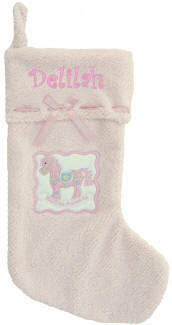 Celebrate her first ever Christmas with a special pink Christmas stocking. Embroidered with Baby's 1st Christmas, and her name for a special keepsake. 19 in.